The accompanying video shows a lungfish that uses its fins for walking and this could help to clear up the mysteries about when our distant relatives moved from water to land. 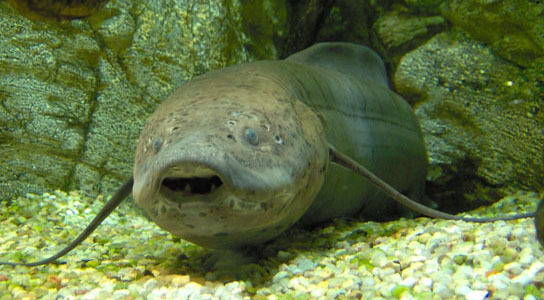 The African lungfish (Protopterus annectens) uses fins similar to the ancestors of the first vertebrates to walk on land. There had been evidence, though it wasn’t concrete, that the fish could use these fins to walk along the bottom of lake beds. And now, thanks to Heather King and her colleagues at the University of Chicago in Illinois, we know for sure. They really do walk using those two pelvic fins. Not only that, but they do it very well. This would suggest that fins were used for walking before the evolution of specialized limbs. They studied the Protopterus annectens because this species is very closely related to tetrapods. (A vertebrate animal with four limbs.) Now it looks like this ability to walk on these fins arose before the evolution of digits and before animals made the transition from water to land. Be the first to comment on "Lungfish Use Pelvic Fins to Walk Underwater"